It is easy to learn German via Skype, you can access it wherever you have an Internet connection and have your class nearly everywhere, e.g. at home, in a cafe, or at your workplace. You don’t need to know a lot about computers, a basic knowledge and Skype is enough to have German online lessons. For people based outside Austria, or at a distance from Vienna, with unusual work schedules or a very busy timetable is not easy to fit in a regular German course. They often need very flexible lessons with the possibility to change their dates last-minute, which is only possible as a personalized course, a mix of in-person meetings and Skype / WhatsApp lessons. When designing your online course, I'll take your personal and career background, your current knowledge and specific wishes you may have into consideration. The online lessons can be 60, 90 or 120 minutes in length according to your preferences within the time frame available. Pick lesson times that fit around your lifestyle and learn online from any location. Book from just 5 German lessons to a whole language course depending on your needs and goals. Available for standard German lessons and for conversation classes, please ask for an individual price offer. Since I have flexible cancellation policies, you can even cancel or reschedule your lesson on the day before our appointment by no later than 18:00 without having to pay for it. If you prefer not to sit around, we can also have a talk by phone. Improve your listening comprehension and spoken German on your mobile. You'll practice speaking highly concentrated and I'll correct your pronounciation and mistakes. When you have the oppurtunity to speak German daily and get your errors corrected, your confidence and fluency will grow rapidly. 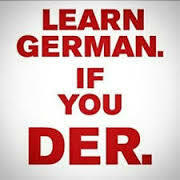 German speaking course gives you maximum speaking practice amongst all available courses. You'll train yourself to understand and reply to anything said to you in German. You build the capability to think, act and react in German and say what you want to in the most effective manner. German speaking classes are the best method to remove your hesitation in speaking. German speaking lessons can be 30 or 60 minutes in length according to your preferences. Pick lesson times that fit around your lifestyle and speak on yor mobile from any location. Book from just 5 German lessons to a whole conversation course depending on your needs and goals. Available only for conversation classes, please ask for an individual price offer. All you can talk: 1-to-1 classes allow as much speaking time as possible. I'll help you to improve your accuracy and fluency 1by carefully correcting your pronunciation and grammar, writing down mistakes and encouraging correct use and practice. In our conversation class we'll have a good cuppa of tea / coffee and discuss topics you choose, we can speak about everything and anything. No textbook, no homework, e.g. only if you want some, and as few a grammar as necessary. You'll use your conversation skills for (business) small talk or chit-chat, sharpen your listening comprehension and pronunciation, practice everyday vocabulary and build your personal vocabulary, all in all improve your ability to act/ask and react/answer. Join me for a walk! Linking learning with movement will be a very new experience for you which is not only for the motoric type of learners. This is an excellent opportunity to improve your fluency and get to know some nice places at the very heart of Vienna. Classes take place outdoor, somewhere in the 1st or in the 2nd district, such as Vienna Old Town, Augarten, Prater etc. We can also go for a strolling in the Mariahilferstraße and do some (window) shopping, get a coffee and a cake in one of Vienna's famous coffeehouses and I could also show you some of my Geheimtipps in the city center. I'll work alongside you at the speed that works for you best. In the first lesson we'll analyse your needs, noting your strengths and weaknesses. My German lessons involve paying particular attention to everyday vocabulary, focusing on the most important grammar topics, providing good practice in colloquial Austrian. Should you need help with any particular area of difficulty, we can target them of course.